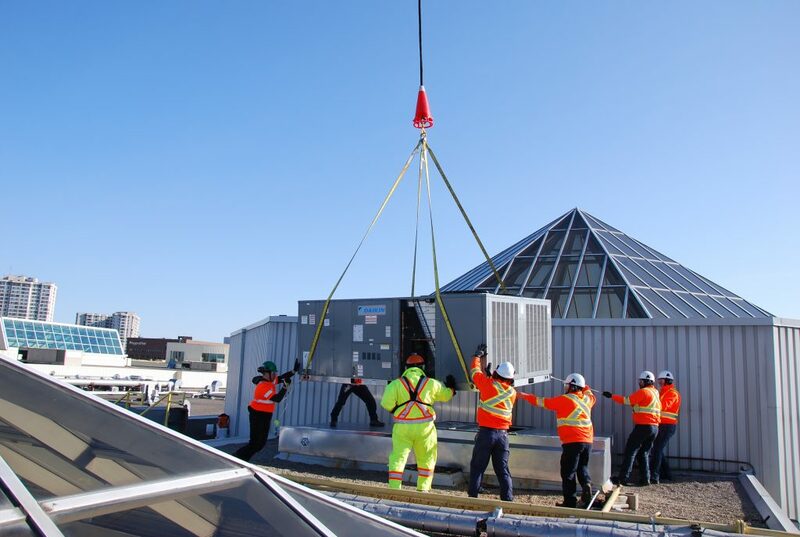 Sprint Mechanical employees install a new rooftop unit on a Toronto area mall. Contractors are welcoming the Ontario government’s plans to remove one of the biggest barriers to bringing new people into the trades. On Oct. 23, the Ontario government introduced Bill 47, the Making Ontario Open for Business Act, which will change the ratios and wind down the controversial College of Trades, the agency created by the previous Liberal government to oversee the trades. “For small companies like ours this is going to be wonderful because we will be able to sign more people up…. We have in the past lost some very good employees because we couldn’t accommodate them,” remarked Nancy McKeraghan of Canco ClimateCare, Newmarket, Ont. “The goal is to have a three-year residential apprenticeship, but it gets extended because we can’t get them signed up and get them into school, so what everyone has been doing… is that they challenge the exam. While they may be able to pass the exam, they may not have the real solid background that you’d like to see in the trade,” added Grochmal. The College of Trades was established in 2009 to administer apprenticeships and enforce licensing, which it began doing in 2013. Legitimate contractors applauded the College’s efforts to clamp down on renovation contractors and others doing work in the mechanical trades without the appropriate licenses, but they also found themselves targeted at times. There was a question about where people on a job site who were neither a journeyman or apprentice fit in. When sprinkler fitter became a trade in 2017, suddenly plumbers and steamfitters that had been doing that work for years couldn’t. They were supposed to be grandfathered in and given their sprinkler fitter licences, said Salvatore. “I had 50 guys; none of them got it… Some of them were 30 years in the trade; all of a sudden they couldn’t do it anymore.” The result was that the cost of sprinkler fitting tripled because there weren’t enough qualified trades. Martin Luymes, vice president of the Heating, Refrigeration and Air Conditioning Institute of Canada (HRAI) said in the group’s newsletter: “It is unclear what the implications will be of the reclassification moratorium on the development a hydronic heating trade program, which was seeing some real progress of late. However, everyone agrees that changing the ratios was critical in an industry where so many experienced people are reaching retirement age. “I believe that going forward with the one-to-one is very advantageous for youth – and anyone – wanting to come into our industry,” remarked McKeraghan.